The Venetia Burney Student Dust Counter – located on the deck opposite New Horizons' large antenna – is the first instrument on a NASA planetary mission to be designed, built and operated by students. New Horizons is up from the longest nap of its cruise to Pluto, as operators “woke” the spacecraft from hibernation yesterday for its annual series of checkouts and tests. The actual wake-up call went in months ago; the commands for New Horizons to power up and reawaken its hibernating systems were radioed to its computer before it entered hibernation on Dec. 16, 2008. During hibernation, as the spacecraft traveled almost 200 million miles toward its goal — the Pluto system — New Horizons sent back weekly status reports as well as biweekly engineering telemetry reports. Then at 6:30 a.m. EDT on July 7, operators at the Johns Hopkins University Applied Physics Lab (APL) in Laurel, Md., contacted the craft through NASA’s Deep Space Network and began downloading data on its health. Tagged “ACO-3,” New Horizons’ third annual checkout offers the team a chance to flight-test some spacecraft updates, such as new software that manages the solid-state data recorders. The team will also turn on and check each of the seven science instruments, as well as the power, propulsion, and guidance and control systems. Mission Principal Investigator Alan Stern, of the Southwest Research Institute in Boulder, Colo., says this ACO differs from the first two. “The ACOs have now become a summer event, switching from the fall to allow the team to get into the rhythm of spring planning and summer activity necessary for the July 2015 encounter at Pluto,” he says. 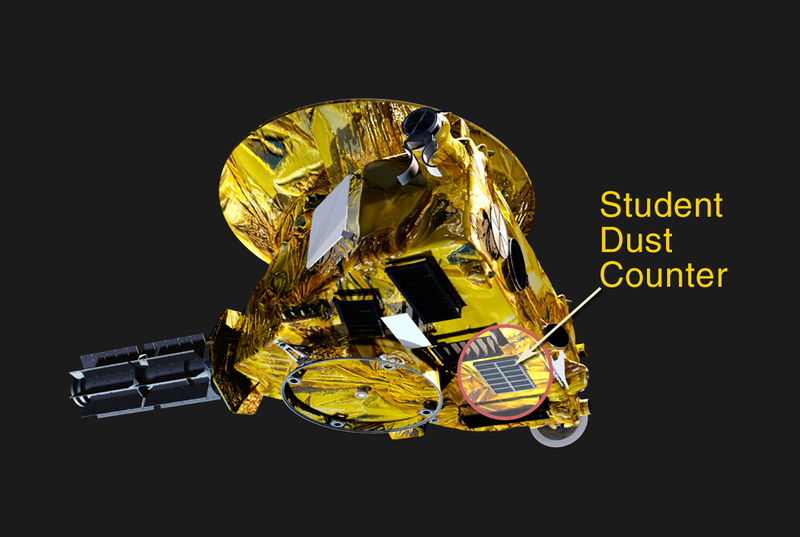 The only busy scientific instrument on the spacecraft over the past eight months was the Venetia Burney Student Dust Counter (VBSDC), which quietly collected information on the number of dust particles along New Horizons’ path through the outer solar system. During the spacecraft’s trek through hibernation – which covered 1.91 astronomical units, or more than 177 million miles – VBSDC was calibrated to gain information on the amount of background noise that can affect the science data and to test the sensitivity of its internal electronics. That dust counter data will be sent back to Earth this week. New Horizons is now 1.19 billion miles (nearly 1.92 billion kilometers) from Earth, speeding away from the Sun at just over 10 miles per second. At that distance, radio signals (traveling at light speed) from home need an hour and 46 minutes to reach the spacecraft. The spacecraft is scheduled to complete ACO-3 and re-enter hibernation on August 27. The hibernation period from December 16, 2008 to July 7, 2009 was the longest planned before New Horizons reaches Pluto. The previous record was 91 days, from June 3 – September 2, 2008. Hibernation periods of approximately 136 days are planned for 2012 and 2014.